We keep a hibiscus syrup stock during the summer which makes this recipe extremely easy (read more here). If you don’t keep a hibiscus syrup around consider doing so — this recipe is a great opportunity to try it out. 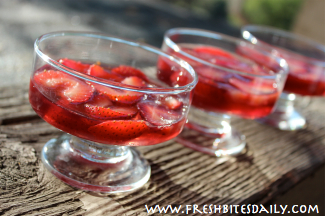 This gelatin dessert is simply a combination of hibiscus syrup, water, gelatin, and strawberries. You can put it together in ten minutes and then simply allow a few hours for it to set up in your refrigerator. Any berry would work well with hibiscus. In fact, this simple recipe is a great opportunity to experiment with flavor combinations. Put water in a small bowl. Sprinkle gelatin on it and allow it to sit for three or four minutes to dissolve. Create your hibiscus base — use hibiscus syrup as a base or a strong hibiscus tea. Be sure to taste your creation since it will be the basis of your dessert. Sweeten with additional honey or other sweetener if it needs it while you heat it for this dessert. Bring your hibiscus tea to boil and pour over the gelatin mixture, stirring to allow the gelatin to dissolve fully. Let sit for about five minutes. 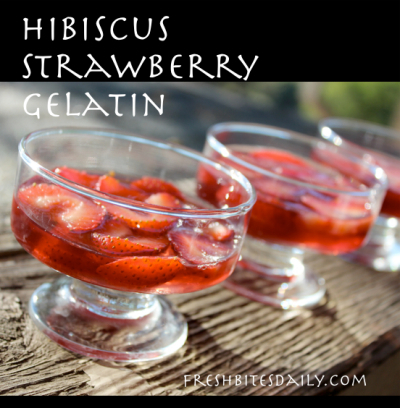 Arrange strawberries in your serving dishes and pour over the hibiscus gelatin mixture. Place gelatin dishes in your refrigerator for about three hours until they have set up. Top with whipped cream before serving for an extra treat. This tea may help fight a cold and may even lower your blood pressure and cholesterol at the same time….